Tag line: "The last defense. The last hope. The battle for the future of the world has begun"
Three U.S. astronauts, Howe (Tim Choate), Walker (John Walsch) and Jordan (Kate Lynch), have been orbiting the earth for 407 days on a space station armed with nuclear warheads. Tired of their long confinement, all three are counting the days until they can return to earth. Then, the unthinkable happens: a nuclear war breaks out between the United States and the Soviet Union. As they watch from space, the world below is obliterated in the blink of an eye. Several weeks later, Howe picks up a short-wave radio broadcast from his wife telling him the fallout has created some sort of super virus that’s infecting those who survived the attacks. Despite Howe’s insistence that they return to earth immediately (so he can search for his wife), Walker (the ranking officer) decides they’ll stay put and give the virus time to run its course. But someone down below has other plans, and commandeers the station’s computer, forcing the control capsule to immediately re-enter earth’s atmosphere. After crash-landing on a beach (during which Jordan is knocked unconscious), they hear someone stirring outside the capsule, and decide to open the hatch. Before they can react, Walker is dragged away and eaten by cannibals. Thus begins a post-apocalyptic nightmare in which Howe is taken hostage by a heavily-armed vagrant named Vinny (Maury Chaykin), and then is dragged off to a makeshift military base run by Gideon (Kevin King), a teenage dictator with an army of thugs at his disposal. Teaming up with J.J. (Lenore Zann), Gideon’s former girlfriend (and current prisoner), Howe tries desperately to escape, especially after learning that Gideon has taken possession of the station’s last warhead, which is set to detonate in exactly 60 hours! 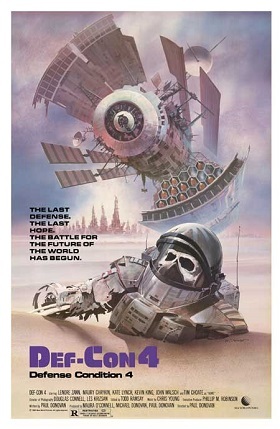 A low-budget Canadian production (forget what the poster shows you; this movie never achieves that level of sci-fi awesomeness), Def-Con 4 starts off strongly, with some tense, exciting scenes set aboard the space station (watching the flashes of light fill their monitors once the war begins, each one signifying that another U.S. city has fallen, is pretty damn intense). The drama continues down on earth (a “trial” set up by Gideon, where he sits in judgment of several characters, is a definite high-point), and a handful of action scenes keep things moving along at a brisk pace. As for the performances, Maury Chaykin (who, years later, would appear in Atom Egoyan’s excellent The Sweet Hereafter) is good as the dim-witted Vinny; and Kate Lynch (Bill Murray’s main squeeze in Meatballs) makes for a convincing astronaut / doctor (her Jordan was the station’s medical officer). Topping them all, however, is Lenore Zann, whose J.J. is the strongest of the bunch (she doesn’t back down even when Gideon threatens to kill her). Tenacious and determined, Zann’s J.J. gives Def-Con 4 a hero worth rooting for. The same cannot be said for Tim Choate, whose Howe is essentially the main character. More annoying than he is interesting, Choate screams his way through several scenes, and lacks the charisma of a leading man (at times, his Howe even acts cowardly). In addition, the movie’s basic set pieces and overall poor production value may bother a few (Personally, I didn’t have a problem with either), and the character development could have been better (we know that, when the war broke out, J.J. was a high school student, mostly because she’s wearing a uniform. Other than that, we learn very little about her). Still, Def-Con 4 delivers the goods more often than not, and, along with Stake Land and Tooth and Nail, is one of the better low-budget post-apocalyptic films out there. I hated this one, Doc. I think it was the poster that ruined it for me. It's one of my favorite posters of all time and my expectations were very high because of the gorgeous art. Still worth checking out, I suppose.